Russian military expected to take delivery of the first serially produced fighters this year; Indian version to be ready in 2018. The Sukhoi PAK FA (Prospective Airborne Complex of Frontline Aviation), aka the T-50 fighter, a stealthy acrobat, will be seen on Russian airspace later this year. The important phase of engine development has been completed, Sukhoi said at the recently-concluded Paris Air Show. According to the Russian military, which just completed stage one of flight tests, initial results suggest the Russian fighter turned out to be on a par with and even better in certain areas than its main American rival, the F-22 Raptor. United Aircraft Corporation Chief Executive Mikhail Pogosyan says five T-50s are participating in the testing programme, which has allowed Russian designers to speed up the process and close the gap with the Americans. The F-22 has been serving in the US Air Force for a long time and is still, for good reason, considered to be the most advanced fighter. Far less is known about its Russian rival. According to its designers, the T-50 is the embodiment of the latest in Russian aircraft technology. A number of innovative solutions have been implemented in the machine, including stealth technology, new construction materials and coatings, artificial intelligence, and the element base, which have brought Russia’s military aircraft building to a qualitatively new technological level. A whole range of the latest polymer carbon plastics have made their debut on the T-50. They weigh 50 percent less than aluminum of comparable rigidity or titanium and are 20-25 percent lighter than steel. New materials cover 70 percent of the fighter’s surface. Its weight has been reduced to just a quarter of that of a fighter made of conventional materials, allowing the designers to increase its combat load. The Sukhoi Design Bureau has highlighted “the PAK FA’s unprecedentedly low level of radar, optical and infrared visibility.” The T-50’s effective reflective area will amount to 0.5 square metres (its predecessor, the Sukhoi-30MKI, has 20 square metres). This means that the Sukhoi-30MKI appears on the radar screen as a 5x4 metre metal object, while the T-50’s reflection would only be a 1/40 of that, making it much more difficult to notice or aim weapons at it – especially as the machine benefits from the exceptional manoeuvrability that has been a hallmark of Sukhoi fighters. In addition, the T-50 meets the main requirement of modern fighters – a high degree of intellectualisation. Its radar, complete with an active electronically-scanned array (AESA), can “see” everything that is going on in the air or on the ground at a distance of hundreds of kilometres. It can track multiple airborne and surface targets simultaneously, while keeping them in the crosshairs of its weapons. Several dozen sensors attached to different parts of its hull not only enable it to monitor the surroundings but also to exchange real time data with ground control and within its airborne unit at the same time. The T-50’s “e-pilot” functionality is constantly analysing the situation, offering the pilot several options to act on. The pilot will receive the bulk of flight and combat data in the form of symbols and signs, making it easier to process and substantially easing the pressure on the pilot, while allowing him to focus on the tactical mission at hand. The T-50 can take off and land from an only 300-400-metre runway. Going forward, it will serve as a basis for a navy variant. Weapons will be stored completely in internal compartments to meet the stealth technology’s requirements. According to certain reports, those compartments would be able to carry up to eight R-77 air-to-air missiles or two up to 1,500-kg guided aerial bombs. Additionally, two long-range missiles could be suspended externally, to allow the fighter to engage targets located as far as 400 km away. The fact that India has joined in development of the fighter suggests that the programme is promising and meets the highest standards. New Delhi has allocated almost $25 billion for this purpose and expects to obtain a proprietary version of the fifth-generation fighter by 2018. It is that machine that will be exported, according to Russian specialists, while the Russian-made T-50 will remain an exclusively domestic model – like the American F-22. 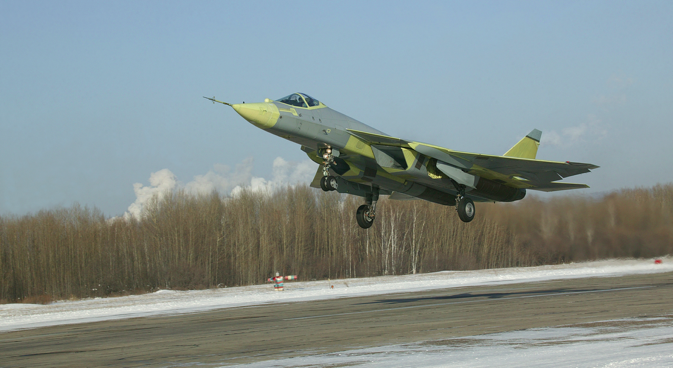 Russian airmen expect to take delivery of the first serially produced fighters as soon as in 2013 and plan to purchase at least 70 units.